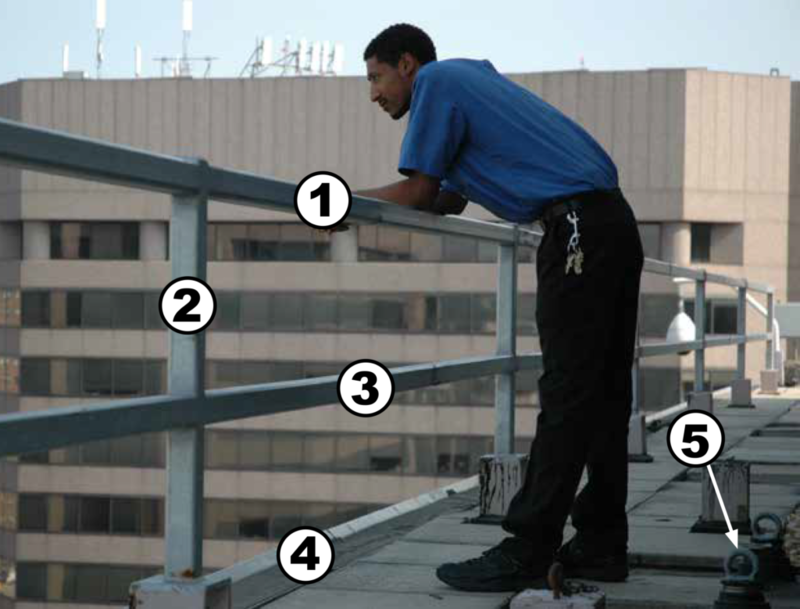 Guardrail Systems – Summit Anchor Co.
What are basic guidelines to designing a guardrail system in compliance with OSHA Subpart D for Fall Protection Systems? 1) Top rail: Must be installed at 42 inches height, plus or minus 3 inches above the walking-working surface. The top rail may not exceed 45 inches, provided the guardrail system. Top rail must be capable of withstanding, without facture, a force of at least 200 pounds in a downward or outward direction within 2 inches of the top rail. 2) Vertical Post: Must have adequate capacity to support the required loading of the mid and top rails. 3) Mid rail: Must be installed at a height midway between the top edge of the guardrail system and the walking-working surface. 4) Walking-working surface, according to OSHA, means any horizontal or vertical surface on or through which an employee walks, works, or gains access to a work area or workplace location. 5) Roof Anchors located within 15 feet of the roof edge require fall protection.